The double doors to the oven that will heat up the ice sample (on the right) are wide open in this image of four pairs of oven doors on Phoenix's Thermal and Evolved-Gas Analyzer (TEGA). The lander's Surface Stereo Imager took this photo on July 19, 2008, during the 53rd Martian day, or sol, since Phoenix landed. NASA will try again Sunday night to to get some dirt into the Phoenix Mars Lander's onboard oven, this time using a revised method. Images received Sunday morning showed the soil collected on Sol 60, the 60th Martian day of the mission, had fallen out of the scoop, which had been left inverted over the lander's deck. 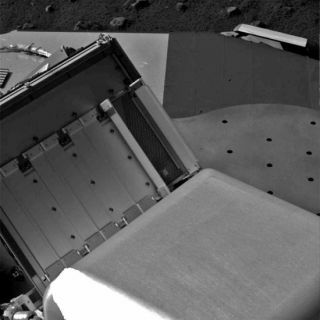 Earlier in the weekend, mission officials had said they thought the material got stuck to the back of the scoop. A screened opening over the oven measures about 4 inches (10 centimeters) by 1.5 inches (3 centimeters). The oven itself is roughly the size of an ink cartridge in a ballpoint pen. The aim of the $420 million mission, which landed on May 25, is to characterize the dirt and icy layer that lies below it in the north polar regions of Mars to look for signs that the planet might have been habitable at some point in the past. Mission scientists have applied to NASA to extend the mission past its originally-slated 90 days.